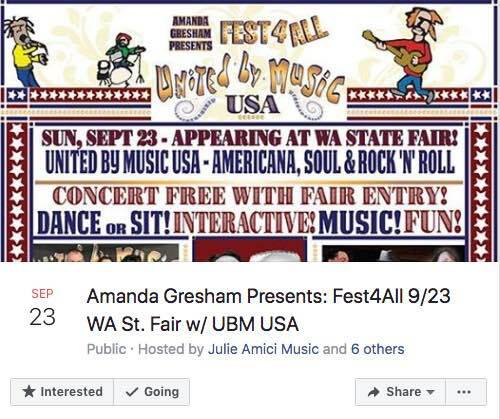 NOTE: The Fest4All United by Music Showcase on the ShowPlace Stage is FREE with WA State Fair Entry for 9/23. 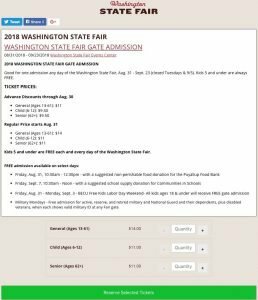 A UNIFIED DAY of Americana, Blues, Soul and Rock n’ Roll at The Washington State Fair. EASY ACCESS THROUGH BLUE GATE – We are on the ShowPlace stage just a few steps from Blue Gate entrance! THIS DAY IS MUCH MORE THAN A SERIES OF EXCELLENT MUSICIANS AND BANDS. The audience will be brought into the experience of these 30-plus musicians and 6 bands ALL UNIFIED in presenting a true FEST4ALL! Musicians from one band may blend into the next and all for the purpose of CELEBRATING INCLUSION THROUGH MUSIC! United by Music USA representatives are available all day to speak with you to discover if YOU or someone you know might be interested in JOINING THE FUN of being a musician, mentor, or supporter, donor, or volunteer with the United by Music USA/North America Band. 10:00 – Discover United By Music USA! Reminisce during the PATSY & LORETTA TOGETHER AGAIN with JULIE AMICI and MARY CAMERON featuring an award winning band from Portland, OR The combination of these two lovely voices and seasoned musicians make for an inspired performance sure to bring back warm memories of classic tunes made popular by Patsy Cline and Loretta Lynn, who were best friends prior to Cline’s untimely death in 1963. Audiences will be treated to a tasteful musical journey that will include a history of Loretta and Patsy’s hits. From THE VOICE TV Show to showcasing her sultry sounds all over the world STEPHANIE ANNE JOHNSON presents her new Band The Highdogs with high energy bluesy, funky, soulful dance tunes. 2016 Best in Blues Performance Event (Muddy Awards-Oregon) recipient United By Music North America performs hit after hit from their new album “YES WE CAN CAN” with these stellar PacNW Talents throughout the day! Puget Sound’s Rockin’ POLLY O’KEARY & THE RHYTHM METHOD will pump you up with their high energy blues.Read Polly’s bio on her webpage listed above and you will understand the truth in this: A blueswoman with a PH.D, a world-traveled bassist, one of Washington State’s most highly-awarded female blues singers and songwriters (six-time Washington Blues Society Best Female Vocalist, four-time Best Blues Songwriter, etc.) Her music reflects the life of a modern blues woman; she’s seen the river rise and take everything more than once, and lived to laugh, sing, and write music about it. Get groovin’ to BONNIE RAITT’S tunes and original songs by BRE GREGG’S Red Bird Trio, making their Washington State debut through Amanda’s Fest4All. All three musicians are stellar in their craft with multiple recordings and full schedule of performances based in Portland and traveling wherever great music is appreciated. Aussie KARA GRAINGER brings her roots and soul sounds to the mix of the day. 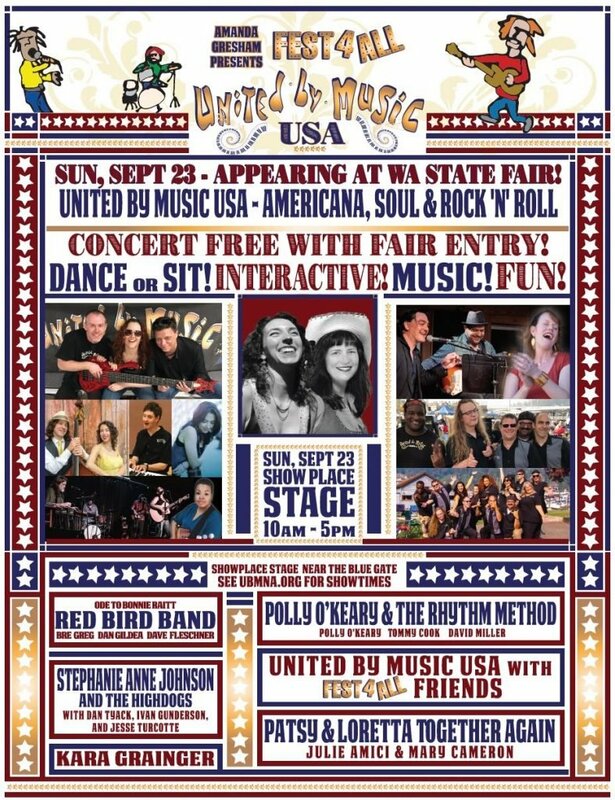 Kara’s far reaching travels and performances & curious spirit inform the depth of her music and her choice to be with United by Music at The Fair! UNITED BY MUSIC NORTH AMERICA/USA is a unified performance-based program and band for both neuro-diverse and neuro-typical people with exceptional musical talent. This blended band of program artists and professional musicians brings high energy shows to appreciative audiences wherever they perform. World-Wide and Year Round! UBM artist ambassador NICK BAKER will be featured at the beginning of the day with some of his originals and well as crowd favorites.